From left: finalists Luke Lunday, Aubrey Cline, Arica Hamilton and Megan Haggerty spoke on the effect of solar power plants on rural communities. On Sunday, March 31, high school students from all over western Ohio came to Wright State University to compete in a speech competition. The competition was hosted by the Wright State Department of Communication. Wright State has hosted the District 6670 Rotary Club four-way speech competition since 2013, which encourages students to choose a topic and apply it to four questions: Is it the truth? Is it fair to all concerned? Will it build goodwill and better friendships? Will it be beneficial to all concerned? Beth Huber, district chair of the Rotary Club, said she is always encouraged and looks forward to hearing topics the students choose. Huber also extended her thanks to the university for hosting the competition every year, as well as thanks to Wright State faculty who participated as volunteer judges. Communication faculty members Dave Baxter, Mary Rucker, Melissa Spirek, Jessica Lawson and Martha Antolik, as well as Tracey Hill, the department’s administrative support coordinator, participated. Several alumni also assisted at the competition. The students’ speech topics ranged from positive and empowering to revealing harsh truths they have faced, such as the problem of advertising to teens, encouraging respect in high school sports, choosing a career you love and climate change. 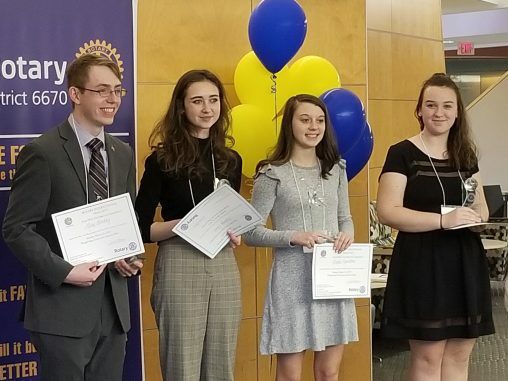 The four finalists, Arica Hamilton, Luke Lunday, Aubrey Cline and Megan Haggerty, spoke on the effect of solar power plants on rural communities, encouraging discussion and understanding of disabilities, a more effective foster care system and the mental health of high school students. Rucker, professor and chair of the Department of Communication, said she is always encouraged to hear what the students speak about each year. “This is such a good chance for students to showcase their public speaking skills,” she said.